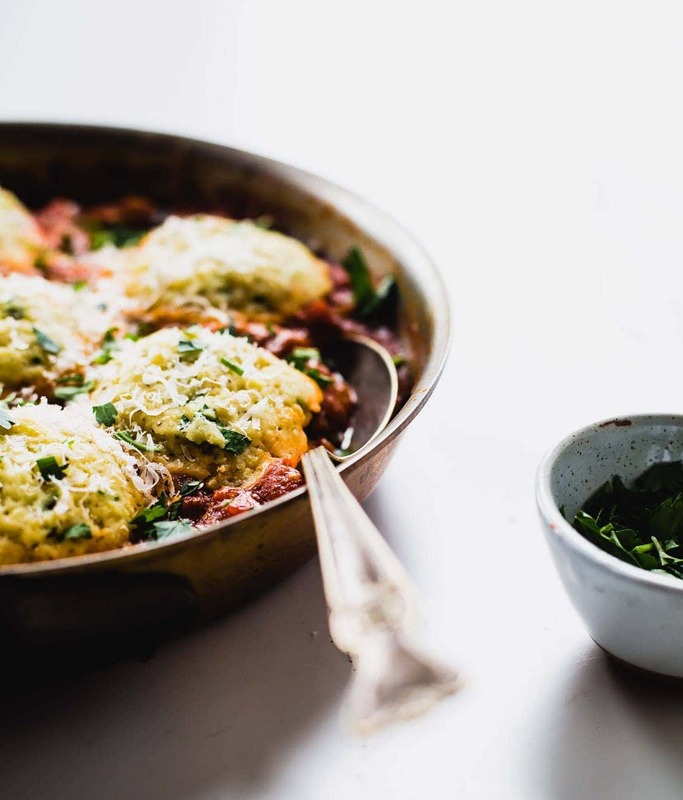 This Tomato Cobbler recipe is sponsored by Tuttorosso Tomatoes, a partner of Heartbeet Kitchen. It’s the end of February and all I want is a July tomato. We’ve had a colder than average winter here in Minnesota, and our little escape last week to Fort Myers, Florida was welcomed. You’ll find that most of us northerners need a break from the gray skies and snow, even though we love this place so much we’d never move away. Even though seasonal cooking gets a bit desperate come this time of year, with about two months to go until spring, I’ve found a few ways to get around it. Canned tomatoes, fresh herbs, summer fruits I’ve frozen, they bring me a summer feelin’. Over the past few years, I’ve come to learn that much of how your canned tomatoes taste and look has to do with how they’re picked, and how they’re canned. With their Steam-Seal technique, Tuttorosso’s tomatoes taste just like they were picked in the hot July sun – because they were! They’re grown on fifty family farms in Indiana, harvested when they’re ripe, and canned immediately. The steam-seal refers to the technique of canning that we do at home, preserving without preservatives or anything artificial. 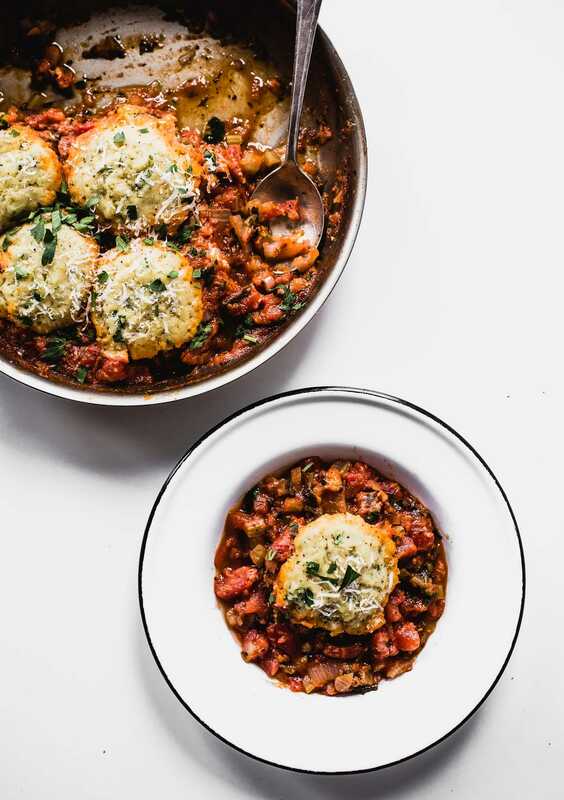 To make this cozy Tomato Cobbler with Gluten-Free Drop Biscuits, I used Tuttorosso’s new, diced San Marzano tomatoes with Garlic, Basil, and Olive Oil. I love how much flavor they have, and their plump, juicy texture. Simmered with onions, celery, and a little butter (always! ), the tomatoes make the perfect nest for the biscuits. Drop biscuits are easy to make, no kneading or complicated instructions. My gluten-free version is a blend of almond, sweet rice, and millet flours. They’re soft and fluffy, studded with black pepper and chives. And they cook right in the middle of the bubbling tomatoes on the stovetop. Below is a step-by-step video I made in my kitchen, that should help you visualize the process. This dish is best eaten the day of making. Enjoy! Heat olive oil over medium high heat in a deep saucepan, at least 10 or 12 inches in diameter, that has a lid. When hot, add onion and celery. Stir and cook for five minutes, until translucent. Add tomatoes, salt, pepper, maple syrup, and butter. Simmer for 15 minutes, uncovered. Meanwhile, make biscuits. In a bowl, combine flours, baking powder, salt, and pepper. In another bowl, whisk together milk, egg, and melted butter. Stir liquid mixture into dry, gently turning a few times, then add parsley. Gently stir until no streaks of flour remain. Using a cookie scoop like this, scoop biscuit mixture and add to tomatoes, giving them at least an inch between each other for room to expand. Put lid on and cook on medium low for 20 minutes. Remove lid, and let rest for 5 minutes. Top with grated parmesan and a sprinkle of parsley. Serve immediately. Adapted from this recipe, via Cooks Country magazine. such a great video! you make it look easy. :) your biscuits are completely perfect! 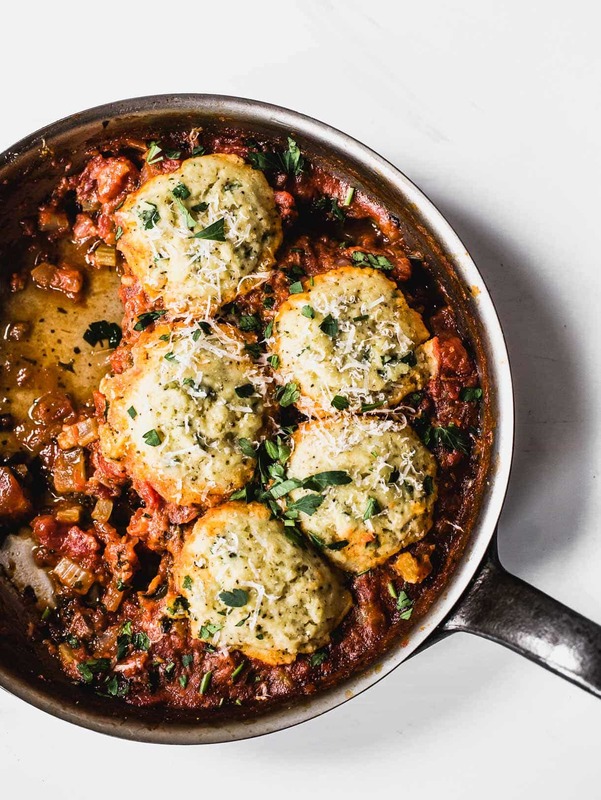 I’ve always wanted to make a tomato cobbler … now with this version I know I don’t need fresh tomatoes! This was SO yummy! And easy! I ended up using Bob’s Red Mill GF blend to make it easier for myself! I did that + A small amount of almond flour and it turned out great! SO fluffy and delicious !! This was delicious. We followed the recipe exactly and it was as ease as pie…well…er….cobbler! So simple and fast. The consensus is that this recipe would be a good thing to impress dinner guests with. I would never have thought to make this, but now I’ll be making it often! I own Restaurant in Udaipur. I love to know about various Food and Cuisine Styles to add in my Restaurant Menu. Thanks for the detailed Recipes.